CEO Members - English readers : Is it a good idea to develop the english part of the mag ? A good idea but it doesn't change a lot. I don't read it since a few years. I'm not member of CEO. 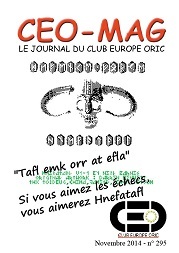 Since November, 6th ; CEO MAG 295 is online. As much as possible and depending on my ability (or on authors time availability), a part of the mag is translated in english and in french if the original article isn't in french.